With a week full of field trips, potlucks and fireworks, our family will be on the go most every day. My saving grace is my stocked freezer – so all I have to do is plan ahead, pull out of freezer and gather around the table. My mom will arrive on Wednesday. So we’re gearing up for her visit by prepping some homemade yummies like Blueberry Quinoa Scones and Zucchini Brownies. Menu planning helps me keep dinner time easy-breezy between my kids’ fun summer activities and all the camping we like to do. Taking advantage of a great sale on beef at our local grocer, this week’s menu will include quite a few of our favorite beef dishes. Summer has officially begun in our household, and with 4 boys of our own home every day, all day, plus an additional 4-6 daycare kids, I have to be on top of my menu planning game! As a vegetarian/meat-eating blended-eater family, barbecue holidays are always a bit of a challenge. Especially now that we’re Getting Real and we can’t just toss some veggie dogs on the barbecue! Tis the season for end of the school year activities! 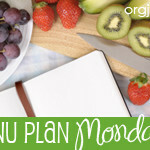 Having a menu plan for my week means that I don’t have to try to figure out what is for dinner on a busy night with all the other crazy activities going on. What a crazy busy couple of weeks coming up! We have the school year ending in two weeks, and there are a flurry of activities associated with that: field trips, volunteer breakfast, field day, end-of-the-year party, etc. . .
We will of course be relying heavily on eating meals “from the freezer” for not only our family suppers, but also daycare toddler meals and snacks. A typical week in the life of Kim, our Whole Foods writer. Complete with plans for breakfast and toddler meals. We’re having some of our favorites, along with some new whole food treats, this week for lunch and dinner since we’re finally getting settled back in from our trip. Gluten Free Dairy Free Menu Plan this week highlights a favorite freezer recipe: Slow Cooker Garlic Chicken. As if our life wasn’t busy enough, tee ball season has started. Insert the NEED for simple make-ahead meals at my house! Spring has arrived, and this means lots of outside playtime for the kids! It also means our meals become quicker, lighter and we do a lot of grilling! Our (Kristi’s) family had a bit of a family emergency this month, so the kids and I packed up to visit Grandma. This sent our menu plans into a bit of a tizzy since my mom isn’t quite as far along the Get Real spectrum as we are at our house. I’ll admit I get a little mopey every time I speak to my husband over Skype…and not just because I miss him, but also because I can see my beautiful stand mixer and food processor in the background.